Raising vegetables is a rewarding activity. You get to enjoy the outdoors, get some exercise and end up with good things to eat. 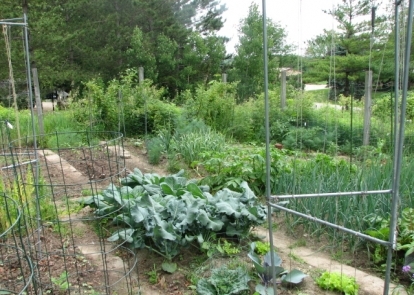 I grow all the common vegetables: tomatoes, summer and winter squash, beans, peas, radishes, peppers, beets, cabbage, broccoli, Brussels sprouts, onions, garlic, spinach and several varieties of lettuce. Although I really don't have the space to justify it, I also grow some sweet corn and potatoes. Its fun to dig up the potatoes to see what you will get, and freshly dug potatoes are unbelievably good tasting. I sometiems plant the corn late, in mid-June. The vendors at the local farmer's markets are in a rush to have the first corn of the season, but it is all gone by early September. That is when my corn is just getting ready to pick. My vegetable garden is about 25’ X 30’. It has a fence around it because rabbits are a real problem around here. Cement blocks from an old silo form paths and divide the area up into growing beds about 15’ long and 3-4’ wide. I can stand on the cement and reach into the beds without walking on the soil and causing it to become compacted. The different beds are also an aid in crop rotation. A view (see map) of the vegetable garden in mid-June 2009. The silver poles are supports for squash and the green wire cylinders are industrial strength tomato cages. These are home made. 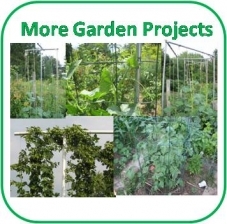 Check out the Garden Projects page for info on building these and other garden gadgets. I pretty much use organic growing practices but do use a little chemical fertilizer. I am a big believer in using a lot of compost, and have a large composting area. Every fall I till in a 3-4” layer of leaves into the garden beds. They break down over the winter and by spring the soil only needs a little spading to be ready for planting. I keep a map of what is planted where so I can be sure to move crops to different areas each year. In the garden, plants and seeds are planted in blocks, not rows. Seeds are planted with the spacing I want for the full sized plants. I only plant a bit more than I expect to eat. This leaves a lot of seeds left over. Properly stored, many vegetable seeds can remain viable for many years. Saving unused seeds is a good way to cut the expense of gardening. Vining plants like squash, cucumbers and pole beans are grown on vertical supports. This saves a lot of space and keeps the squash off the ground and safe from slugs and other pests. I also made some industrial strength tomato cages. Information on making these and other supports for various vegetables is available on this site. 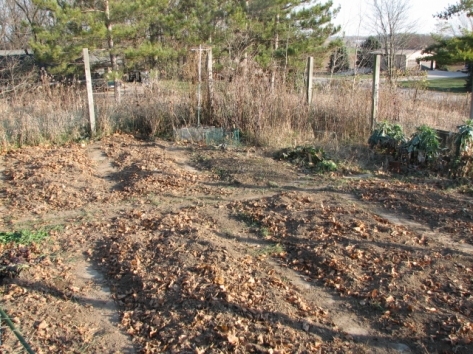 This is a picture of the vegetable garden in late fall. A 4" layer of leaves has just been tilled into the beds. By spring the leaves will have broken down and the garden soil will be ready for the early spring plantings of onions and peas. The only crops left are Brussels Sprouts in the far right and late fall spinach in the lower left. Garlic bulbs for next season were planted near the end of September. Spring spinach is planted in late November. Note the cement block walk ways between the beds. 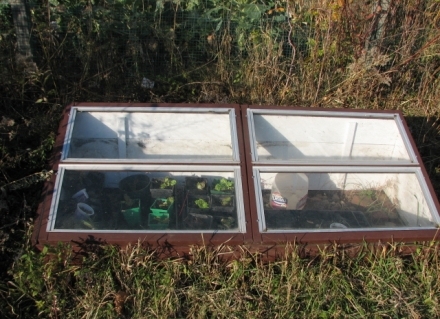 This is a cold frame for getting seedlings started in the spring. The size was designed to hold 5 of the standard garden plant flats. The front and back are made from 2" X 8" pine and the ends from plywood. The glass was salvaged from mobile home windows. The cover is hinged at the back in two parts and I can open either or both sides.